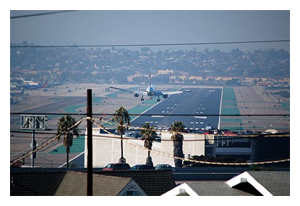 The Lindbergh Field San Diego Airport is located in San Diego California just west and north of the metropolitan center of downtown San Diego. 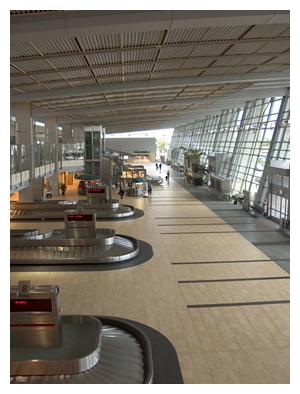 The San Diego airport is an international airport with 3 terminals including a commuter terminal. 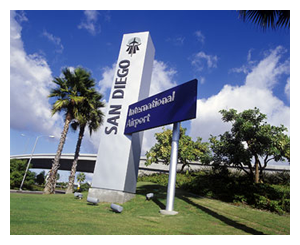 The San Diego airport code is SAN, it is also known as San Diego International Airport, KSAN, and Lindbergh Field. You can find information about the San Diego airport for terminal information, flight times, tickets, travel destinations, general information about the San Diego airport, San Diego Airport contact information, directions to the San Diego airport, directions from the San Diego airport as well as accommodations in and around the airport such as San Diego lodging, San Diego attractions, San Diego entertainment, and transportation to and from the San Diego airport. Accommodation surrounding the San Diego airport includes restaurants, malls, pubs, nightclubs, strip clubs, cruise liners and everything you may need to enjoy San Diego. You can also find places to eat, sleep, and shop within the airport. Dropping people off and picking people up at the San Diego airport can be tricky. Just remember to pay attention to the signs as you are driving through the airport to the terminals and obey traffic laws. You will find that making loops around the airport is easy as long as you pay attention and relax. There are traffic police who will issue tickets to drivers not following traffic laws, but they serve mainly to regulate traffic by keeping everyone moving. Do not park your vehicle in any terminal pickup or drop off zone for more than a few seconds or long enough to load or unload your package. The San Diego airport lies just west of the 5 freeway which is connected to the 94 and the 8 San Diego transportation freeways. The 5 and the 805 freeways also merge in north county San Diego. From north San Diego you can simply take the 5 south until you see the airport. There are numerous clearly marked exits that will guide you to the San Diego airport from the 5 freeway. Navigating to any destination from the airport can be confusing just as navigating any other familiar place, but if you can determine your bearings early on you will find navigating relatively easy. The airport is not located at the central hub of many freeways. Indeed there is one main highway to get to there that runs east west along the San Diego harbor. If you follow this road east from the San Diego airport you will reach the entrances to the 5 freeway. Keep going east from the San Diego airport and you will reach downtown San Diego. Going west will take you to Shelter Island and Point Loma. These areas are not metropolitan San Diego and so are farther away from large freeways such as the I-5. 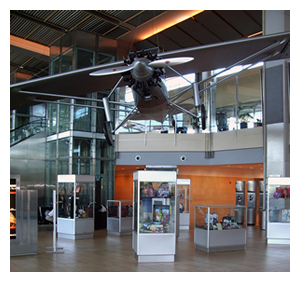 The San Diego International Airport is one of Southern California’s busiest airports offering a world-class travel experience for domestic and international travelers. It offers benefits to coach and business class flyers such as luggage transportation, discreet security, wireless internet services, shuttle services, regional information services and more. Most informational signs are displayed in English and Spanish. As always, never leave your luggage unattended. Do take airport security very seriously. Bomb threats, suspicious items, or even talking about sensitive subjects such as terrorism, explosives, or drugs may be responded to by airport security in serious ways that could cause you to miss your flight. There is no smoking allowed inside, although the consumption of alcoholic beverages is allowed. Eluxx Transportation is a high quality private transportation provider similar to a sedan San Diego airport transportation service that offers all the benefits of a sedan service for a much lower price. They offer ASAP and ride by reservation trips to the San Diego Airport for individuals and corporations in and around San Diego. Because Eluxx operates hybrid vehicles, they are friendlier to the environment and less expensive to use than taxis, limousines, or sedan services, Eluxx Transportation can pick you up from the San Diego airport at anytime day or night. They can also drop you off at anytime. Eluxx transportation is an excellent alternative to airport shuttle service or sedan service as they offer quality, convenience, service, and privacy at low cost. Just five minutes drive from the San Diego airport you will find many great places to visit and enjoy including Shelter Island and Point Loma to the West, Old Town and Downtown to the south east, and the San Diego harbor adjacent to the airport itself. Shelter Island is great for anyone coming from the airport for its Hotels, restaurants, and scenic surroundings including the San Diego harbor and Point Loma. Getting to Shelter Island and Point Loma from the San Diego is as easy as taking a short drive west on Harbor Drive which is the main road the airport terminals driveways and parking lots exit to. Go south east from the airport to head over to Old Town, Little Italy, and the historic gaslamp district where you can enjoy world class restaurants, historic San Diego landmarks, and nightlife. You are only moments away from great food, exciting nightlife, world class hotels, and all while being situated in the heart of San Diego’s beautiful scenic environment. A list of current flight times, flight delays, flight status, and other important information regarding your travel can be found on the San Diego airport website. The website shows a list of flights and flight statuses on their flight info page or you can search for your flight status by airline. Although the website claims that every effort is made to ensure accurate and up to date information, they request that you contact the airlines themselves at their respective terminals by phone if you have additional information or see an error on in the flight times or flight statuses. You can find this information on the San Diego airport website at san.org/airport/flights/airlines.asp (as of June 2009). Eluxx offers very competitive rates to and from the San Diego Airport as well as top quality service and dependability on par with limousine, shuttle, and sedan services. You can click here to request a quote online or over the phone at (844) 458-9954 for a private ride to or from the San Diego airport by Eluxx Transportation.